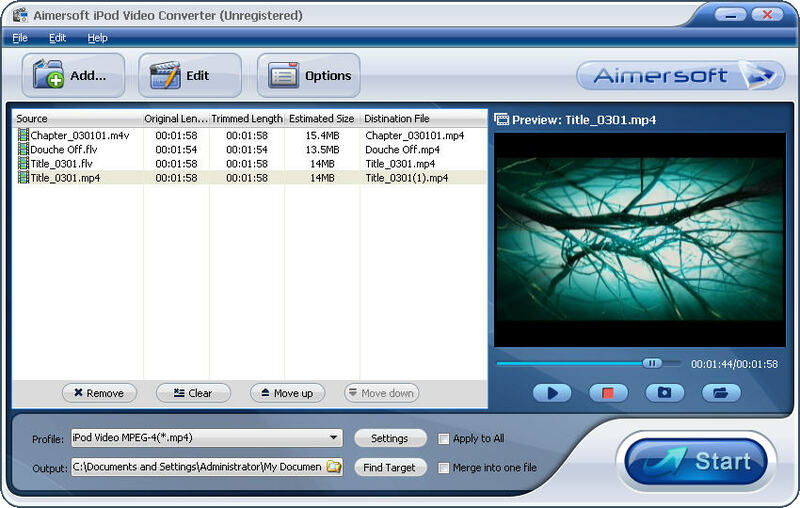 Aimersoft iPod Video Converter is an outstanding video to iPod Converter that could convert video to iPod and the new iPod Nano/Touch/Classic. It is also a iPod Movie Converter, it can convert video to iPod MP4/H.264, and also can perfectly convert almost all popular video and audio formats such as AVI, Divx, XviD, WMV, MPEG, MPG, FLV, DAT, RM, RMVB, MOV, ASF, FLV, etc. to iPod supported formats. This iPod Video Converter can convert video to iPod Nano/Touch/Classic. 2. Support to convert FLV format (like, youtube, Google Video, Yahoo! Video, Myspace Video) to iPod. 3. Support kinds of video formats: iPod Video converter can convert all popular video formats including AVI, MPEG, WMV, MOV, MP4, RM, RMVB, DivX, ASF, FLV, 3GP to iPod H.264 and iPod MPEG-4. 10.	iPod Copy Manager built in, helps you copy music, video and movie from iPod back to computer. 11. Support customize profile, make your conversion much easier. Qweas is providing links to Aimersoft iPod Video Converter 2.3.0.14 as a courtesy, and makes no representations regarding Aimersoft iPod Video Converter or any other applications or any information related thereto. Any questions, complaints or claims regarding this application Aimersoft iPod Video Converter 2.3.0.14 must be directed to the appropriate software vendor. You may click the publisher link of Aimersoft iPod Video Converter on the top of this page to get more details about the vendor.